The expiration date for the coupons is not mentioned. Another coupon is up and running at AdoramaPIX, coupon code PX2FLASH15 gets you 15% off site-wide until 8/31/17 at 11:59pm pacific. Coupon cannot be combined with other offers. Free shipping with $49+ orders (I think that’s after the coupon discount is factored in). Or if your order is between $50 and $66.67, use the $10 off $50+ coupon. Another coupon has gone live at AdoramaPIX – use coupon PX50PRNT to get $10 off a a photo prints print order of $50+. Cannot be combined with other offers. Free shipping with order of $49+. Offer ends 9/4/17 at 11:59pm PT. We have a third coupon promotion live until Sunday night (8/27/17) at the AdoramaPIX website. It is a 3-day flash sale coupon that went live earlier today, coupon PXFLASH15 gets you 15% off SiteWide for your printing orders at AdoramaPIX! Print away 🙂 The coupon cannot be combined with other orders. Free shipping with (post-coupon I believe) order totals of $49+. Coupons cannot be stacked or discounts combined. All coupons mentioned here expire 8/27/17 at 11:59pm pacific. The 20% off Wood or Metal prints coupon is good until 8/27/17 PM at Adorama PIX but they have also launched a brand new coupon: code PXCHELSEABK15 gets you 15% off Chelsea Fine Art Books until 8/27/17 PM. This coupon can only be used on the Chelsea Fine Art Books and nothing else. Free shipping with $49+ orders. The usual terms/conditions/restrictions apply. It’s coupon time once again at AdoramaPIX, coupon code PXWALLMT20 gets you 20% off Metal Prints, and coupon code PXWALLWD20 gets you 20% off Wood prints. The usual terms, cannot be combined with other offers, free shipping with $49+ orders, and coupons expire 8/27/17 at 11:59pm pacifica time. If you are planning to place a $34.99+ Groupon order, they have a sale ending tonight on Fujifilm Instax Mini Film Pack. The 20-exposure (one twin-pack) set goes for $12, the 60-expose set goes for $36, and the 100-exposure set goes for $58. Free returns. If your order total is $49.99+, then for the next 14 days after purchase you can get free shipping on Groupon purchases, even if they are under $34.99. If you are interested in the Hudson Albums (custom photo books), there are two new coupon promotions running at AdoramaPIX until 8/20/17 PM. It’s Metal Time again! Coupon code PXAMET10 gets you 10% off Metal Prints of any size at AdoramaPIX until 8/20/17 PM. Free shipping with orders of $49+. Cannot be combined with other offers. If you feel like going outside *GASP* and your outside world includes Fry’s brick and mortar stores, good until Saturday 8/19/17 PM, they offer 20% off the photo papers available at their brick and mortar stores. Doorbusters are excluded. Limit five per customer. I’m not sure if the weekly promo code is needed for this offer ~ the box with the offer does not mention the need for a Promo Code. This offer is only available at B&M Fry’s stores. It’s metal time! Coupon code PXMTBOGO (PX = Pictures, MT = Metal, BOGO = Buy One Get One) is a promotion that if you buy one 11×14 inch metal print at regular price, you can get a second one for 30% off. In other words, buy two, get 15% off. This at AdoramaPIX until 8/13/17 PM. A new coupon has been launched at AdoramaPIX, promo code PXWD6911 gets you 6×9 inch wood prints for $12 until 8/13/17. Free shipping with orders of $49+. AdoramaPIX is back with coupon code PXTRAVEL10 getting you 10% off custom photo books at the AdoramaPIX website until 8/6/17 at 11:59pm pacific time. A flash sale coupon is now running at AdoramaPIX, for a limited time only, coupon code PXFLASH10 gets you 10% off your order. Free shipping with orders of $49+. Cannot be combined with other offers. Offer ends Wednesday at 3am ET. This is a heads up! If you are a paying T-Mobile customer, the T-Mobile Tuesdays for August 1st in 2017 will have a 50%5 off promotion for Groupon Local. Of camera and photo interest is that a number of custom photo prints, including metal and books, are listed under Groupon Local. This is the first time this promotion was offered as far as I can recall, so I don’t know if everything under Groupon Local is included or it will be restricted. There is a maximum discount of $10 using the coupon. All you have to do to get these is to be a T-Mobile customer, and logon to the Tuesdays website or app (there’s a special Tuesdays app, not the main T-Mobile app) using your phone number and password. Another new coupon is live at AdoramaPIX, coupon code PXADMET10 gets you 10% off metal prints. Cannot be combined with other offers. Free shipping with orders of $49+. Expires 7/30/17. A new coupon is born at AdoramaPIX, coupon code PXADBOOK10 gets you 10% off custom photo books over there. Hudson Albums are excluded. Free shipping with orders of $49+. Expires 7/30/17. How metal are you? Is Led Zeppelin metal? Do you like metal prints? If yes, AdoramaPIX has new coupon promotion, coupon PXMETAL49 gets you 16×16 inch metal prints for $49 each. Free shipping since orders of $49+ get free shipping. On the other hand, if you like metal but not that heavy of a metal, they also offer 10×10 inch metal prints for $28 each with coupon code PXMETAL28. Or if you prefer more of ballad-metal, they have 6×6 inch metal prints for $11 each with coupon code PXMETAL11. These coupons expire 7/23/17. For more AdoramaPIX and other photo print offers, check the Photo Prints category. A new coupon is born for AdoramaPIX. Coupon code PXADART gets you 10% off site wide (some exclusions may apply). This coupon may be usable only by existing Adorama customers only. Expires 7/23/17. Hudson Albums are frequently excluded from promotions at AdoramaPIX, but a new coupon launched at the AdoramaPIX website is exclusively for Hudson Albums: use coupon code PXHUDSON10 to get 10% off Heirloom Hudson Albums. Offer valid on Hudson Albums only. Restrictions apply. Offer ends 7/24/17 at 3am ET. If you are a T-Mobile customer, rejoice! They finally have some photography-themed freebies for their July 18 (2017) “T-Mobile Tuesdays” freebies. 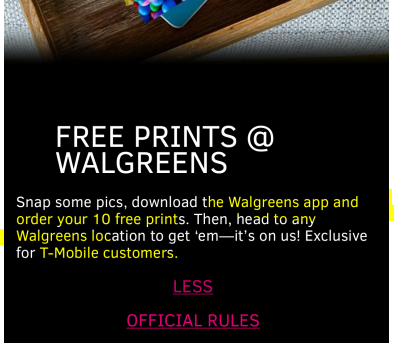 Anyone who is a paying T-Mobile customer qualifies for these offers, and better yet, you get one set of freebies per line, not per customer or main account holder. If you are not familiar, you can get the freebies at the T-Mobile Tuesdays website or by downloading their Tuesdays app (this is a separate app, not the regular T-Mobile app). Prepare for your screen to be taken over by magenta overload 🙂 You login using your T-Mobile account number and password. If you have multiple accounts, login with each phone number if you want to claim more than one set of freebies. Also, some of the prizes to be won (if you play the “games” on their app or website include National Geographic prizes. The previously mentioned coupon code PXSTEP10 gets you $10 off a $20+ order at AdoramaPIX, but if you are planning to place a much larger order of photo prints or custom photo books, coupon codes PRINT4TH (for prints) and BOOK4TH (for custom photo books) get you 10% off the order total. In other words, if your order total is $100+, you save more with the 10% off coupon. If it is under $100, then $10 off is a bigger discount. Cannot be combined with other offers. Coupon cannot be stacked. Free shipping with $49+ orders. Hudson albums excluded. Both coupons expire 7/16/17 at 11:59pm pacifica time. A new coupon is born at AdoramaPIX, coupon code PXSBOOK10 gets you 10% off Photo Books until 7/9/17 at 11:59pm pacific time. Cannot be combined with other offers. Hudson Albums are excluded. Free shipping with orders of $49+. A new coupon is running at AdoramaPIX, coupon code PXUSA10 gets you 10% 0ff sitewide until Tuesday night (7/4/17). Cannot be combined with other offers. Restrictions apply. Free shipping with $49+ orders. Photo prints have in-stock alerts too! Wood photo prints are now “in-stock” (okay, available for printing/purchase) at AdoramaPIX, available in sizes ranging from 4×6″ to 16×24″, with or without a wooden stand to go with them. You can upload photos from your computer (obviously) or directly from a variety of online galleries and cloud services (Dropbox, Flickr, Google Photos, Amazon Cloud, etc). There is a new coupon promotion at AdoramaPIX, coupon code PXDAD20 gets you 20% photo print orders of $39+. Orders of $49+ get free shipping. Cannot be combined with other offers. Coupon expires 6/27/17 at 11:59pm pacific. 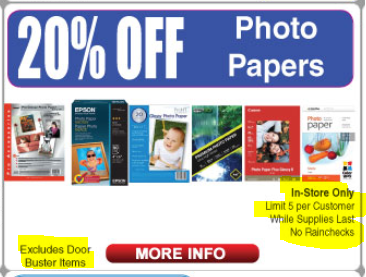 The Epson SureColor P400 Wide Format Printer can be yours for $479 after a $100 mail-in rebate (check in the mail) at B&H Photo and Adorama (it is the second rebate from the two shown over there). You have to do the “add to cart” song-and-dance to see the sale price. In addition to the three previously mentioned coupons (metal prints, paper prints, custom cards), there are two brand new coupons, also running until 6/18/17 at 11:59pm pacific time at AdoramaPIX, coupon PXABOOK15 gets you 15% off custom photo books. Meanwhile coupon code PXACANVAS15 gets you 15%5 off canvas prints. Coupons cannot be combined with other offers. Free shipping if your order total (after the coupon discounts are factored in) is over $49 (before tax/shipping). Coupons cannot be combined with other offers. Not valid on Posters. Free shipping for orders of $49+ after the coupons are factored in and before taxes and shipping. Coupon code PXDADMT15 gets you 15% off Metal Prints at Adorama PIX until 6/11/17 PM. This cannot be combined with other offers. Free shipping with post-coupon order totals of $49+. Adorama PIX is back with another coupon for their website, coupon code PXDADBK15 (PX = PIX, DAD = Dad, BK = Book, 15 = 15% off) gets you 15% off custom photo books until 6/4/17. Offer ends 6/4/17 PM. LivingSocial is now part of Groupon. And for today (5/25/17) coupon code SUNSHINE gets you 20% off at Living Social. Of photography interest, there are a number of services that offer photo prints, custom photo books, canvas prints and the like there. Use the search box there (eg photography or photo books, etc) to locate items of interest. Exclusions apply. Coupon expires Friday 3am ET. The whole “social buying” thing did not pan out as hyped. LivingSocial got in trouble and had to fold itself into Groupon to survive, Groupon is retreating from various markets around the world, and Amazon shut down its own “Amazon Local” service. A new coupon has been launched at AdoramaPIX, coupon code PXGRBOOK20 (= PX (as in Pics) GR(aduates) BOOK 20) gets you 20% off custom photo books. Hudson albums are not eligible for this promotion. Free shipping with after-coupon order totals of $49+. Coupon expires 5/25/17. The Pioneer Collage Frame Embossed “Wedding” Sewn Leatherette Cover Photo Album, in the ivory color scheme, is currently on sale for the very specific price of $17.79 at Amazon by Amazon itself. It averages 4.5 out of 5 based on 150+ customer reviews. You can also buy this using “Subscribe and Save” which has additional discounts. You can make various adjustments to Subscrive and Save subscriptions. The Groupon website has launched a new 2-day coupon, coupon code SALE3 gets you 10% off on Groupon Goods (physical products such as camera gear and electronics) and 20% off on Local Deals (which includes most of the photo print offers such as custom canvas prints, photo books, photo gifts, metal prints, etc). The coupon expires Saturday night. The usual terms apply. The coupon discounts one unit per offer/deal. You can use the coupon on three different Goods, and three different Local Deals (also good on Getaways but I don’t think there’s anything photo-related there). The maximum discount is $50 per deal. Other restrictions may apply. To ease the transition from MyPublisher to Shutterfly, Shutterfly has launched a new coupon code, FORDAD gets you 50% off hardcover photo books, and 40% off other products at the Shutterfly website. Some exclusions apply. Cannot be combined with other offers. 50% off is for the first 20 standard finish pages of the photo books. Offer ends 5/21/17 PM. This coupon promotion expired… It’s coupon time again at AdoramaPIX, coupon code PXSTILLMOM gets you 15% off sitewide until 5/18/17 (Thursday night). The usual exclusions apply. Free shipping with post-coupon orders of $49+. It’s coupon time at AdoramaPIX, coupon code PXMOMNOW (three words, PX (as in pictures) MOM NOW ~ type it without spaces) gets you 20% off Photo Prints. The offer is only good on Paper photo prints, not other material. This cannot be combined with other offers. Free shipping if your after-coupon order total is $49+. Coupon expires Tuesday night (5/9/17). Coupon code PXMOM25 gets you 25% off sitewide at AdoramaPIX as a sale-a-bration of the Mother’s Day festivities that are just around the corner (when you factor in print-time and delivery-time). Free shipping with a post-discount/coupon order total of $49+. Coupon expires 4/30/17 PM. If you are looking for some custom photo print offers (gallery-wrapped canvas, custom photo books, metal or wood or other photo gifts such as blankets or phone cases or coffee cups), coupon code SALE3 gets you 20% off on up to three separate Local Deals at Groupon. Maximum discount is $50 per item. Limit one unit of each offer. Coupon ends 4/13/17. You can locate them by navigating the sub-categories or use their Search Box to search for things like “canvas” or “custom photo book” or “custom photo” (for a wider search net) or “metal print” or search for any service you may interested in, eg “printerpix” or “shutterfly” and such. I tried all the search words in this paragraph and they return multiple results. As usual with coupons, some restrictions apply, for example, some brands may not allow their products to be couponized. UPDATE: this promotion has been extended by a day! 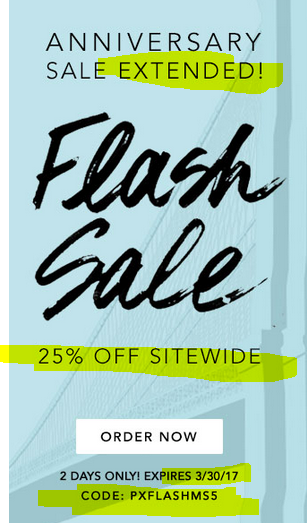 Flash coupon sale strikes again at AdoramaPIX! Coupon code PXFLASHMS5 gets you 25% off sitewide until Thursday 3/30/17 at 11:59pm pacific time (WAS Wednesday 3/29/17 PM). Free shipping on post-coupon order totals of $49+. Cannot be combined with other offers. Custom printing service MyPublisher is shutting down on May 8 in 2017. That’s the last day to access your account. The order cut-off date depends on the order type. The latest is May 8. As a parting gift, they offer coupon code YIPPEE to get you an 8×8-inch photo book at Shutterfly. You pay nothing for the 20-page photo book BUT you pay shipping and handling and taxes. Shutterfly coupon expires 3/21/17 with the usual Shutterfly coupon restrictions.